My friend Alice bakes the best cakes. 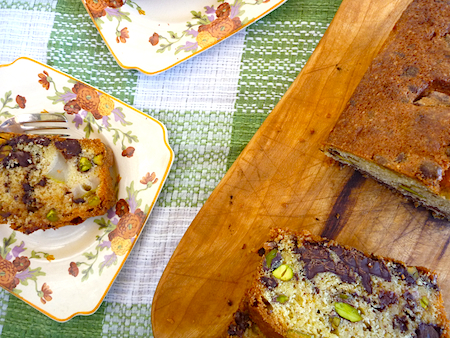 This pear, pistachio and chocolate cake was one of the first cakes she baked for me when we became friends. I remember when I first tasted it and I paused for a long moment in stunned silence before blurting out something along the lines of… THIS CAKE… is… really… DELICIOUS!! That may seem like are fairly prosaic thing to say about cake but you have to take into account the capitalisation and the exclamation marks, because this cake really is… delicious! It is a very simple cake to make and, when baked, it seems to become much more than a sum of its parts. If you can hold off eating the entire cake the day it is baked, it even gets better a day or two later. 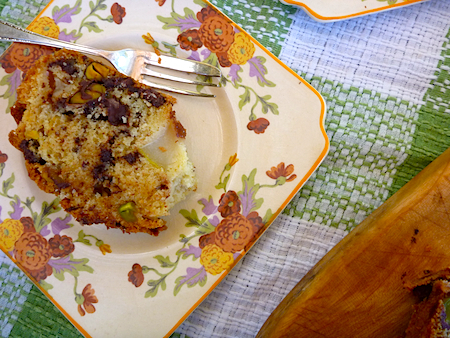 The pear moistens and the chocolate melds into the rest of the cake and it becomes impossible to distinguish which particular ingredient – the chunks of chocolate, the hint of orange zest, the mellow sweetness of the pear or the nutty crunch of the pistachios – makes this cake particularly special. It’s a great cake to wrap up in some waxed paper and tin foil and take on a picnic, a weekend in the mountains, an extra long bush walk or camping trip or any kind of trip really. I’ve never been skiing but this cake would be perfect after a long, exhausting day on the snow fields. A few years ago when a beloved family friend died, my sister and I drove up the coast to Forster for the funeral. Because you can never have too many cakes when you’re offering comfort to a bereaved family, I baked quite a few cakes to take with us. In amongst all the tea drinking and cake eating, my pear, pistachio and chocolate cake got forgotten. A few days later, I unwrapped it from its wax paper and tin foil wrapping and casually offered it around the room. There was the same slightly stunned silence and the same ‘THIS CAKE… is really… delicious!’ comments as when I first tasted it. A seventeen-year-old boy who had never baked a cake before asked me for the recipe and I dutifully emailed it off to him when I got back home to Sydney. The best thing about this cake is how easy it is to make. There is nothing complex about the method and you could almost write the recipe on a postage stamp. In all the years I’ve been making this cake, I’ve only stuffed it up twice and that was on the same day when I was planning to photograph it for this blog (it is one of the cardinal rules of food blogging that whenever you decide make your favorite recipe to post, something always goes wrong). The first time, I simply didn’t line the tin with baking paper, so the cake stuck to the bottom and came out in big jigsaw clumps I had to stick together again. On the same day, I made my second cake perfectly, stuck it in the oven for about five minutes and remembered I’d neglected to add the pistachios. The pistachios are such an essential ingredient that I pulled the just-warmed cake out of the oven, stirred the pistachios through and shoved it back in the oven without even thinking twice. The moral to this story is that both cakes were still perfectly delicious, which is part of the brilliance of this cake – it’s almost impossible to stuff up. If you’re not much of a cake cook and you want to shock and awe you friends with your baking brilliance, this is the cake to make. Try to remember to grease and line your tin properly and add the pistachios but what ever happens, the highest probability is that THIS CAKE, will still be absolutely delicious. This recipe originally comes from Vogue Entertaining: Short Order + Seasonal but it has been baked and championed by my friend Alice for so many years to her friends and family that it is simply known as Alice’s pear, pistachio and chocolate cake. Alice has her own food blog – Alice Bakes a Cake and it is really worth checking out if you are into all things sweet and delicious. The Sardinian ricotta cake, French toast, pancakes, coconut lime bread and THIS CAKE are particular favourites of mine but, of course, everything Alice makes is absolutely delicious! Place flour, sugar, baking powder, salt, butter and eggs in food processor and pulse until just combined (about one minute). Do not over process. If you don’t have a food processor, do this step in a large bowl with a wooden spoon. Stir in the chocolate, nuts, orange zest and pear. Pour mixture into prepared tin, bake for 1 hour (check at about 50 minutes) until a pushed-in skewer comes out clean. Leave in the tin for a few minutes until transferring to a wire rack to cool completely. Will keep well for about a week in an airtight tin. That is a seriously delicious looking cake. Love it. Surely going to try it. Wow Elizabeth – what an amazing cake! So many flavours and textures to discover with every bite!! That is one delicious looking cake. I believe I have all those ingredients on hand so some mid-week baking might be called for. Thanks for sharing! One of my favourite cakes! Gets better with time and is just so satisfying to eat. I love the big chunks of chocolate with the pear and pistachio. 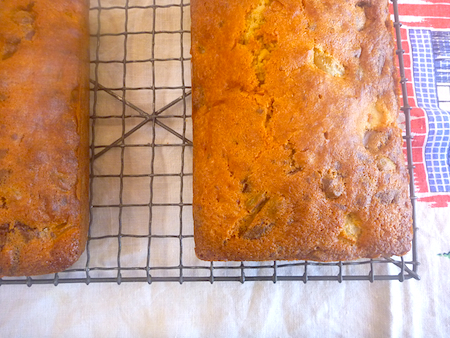 Pistachios are my hubby’s favourite and who doesn’t enjoy a fabulous slice of cake with a cuppa. I have just printed your recipe and hope to make it soon. I will let you know how it goes. Thank you too for popping past my blog.